Antigonish Town & County Library "The People's Place"
Antigonish Town & County Library is one of seven branches in our regional library system and is located on Main Street, Antigonish. We offer a full range of free services and access to the resources of all Nova Scotia public libraries. Antigonish Library is a Community Access Program (CAP) site, sponsored by Nova Scotia Economic and Rural Development and Tourism. At the Antigonish Library you can access a wireless hotspot to high speed Internet. All library programs are offered free of charge. Please call the Library for more information 902-863-4276. 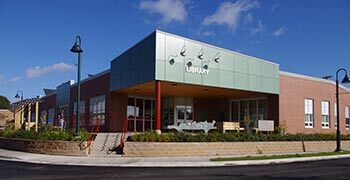 The Pictou-Antigonish Regional Library Board will provide non-profit groups with meeting space free of charge in the Meeting Room and Community Room, when not in use for library activities. These meetings are to be of a non-fund raising, non-revenue generating nature. The Board reserves the right to accept or reject requests for the use of meeting space. View Program Room usage guidelines. FoAL supports the library through advocacy and fundraising for collections. New members are always welcome. For more information please call 902-863-4276. "of course the best way to promote libraries in Nova Scotia is to start one"